The transitions are what make the picture different, even slightly odd, as Bond is taken through a series of tests that call into question his relevance. In a way, it is questioning our own reaction to the super spy who came out of the Mad Men era, whether the man who literally fights towards death every day – and never ties himself down to anything or anybody – can still seem real. This complexity is less rich than described, and does stretch out the film to Freudian lengths, but there is enough in “Skyfall” to satisfy the popcorn crowd, who wants their Bond shaken not stirred, and his colleagues to be familiar reminders of who he is. 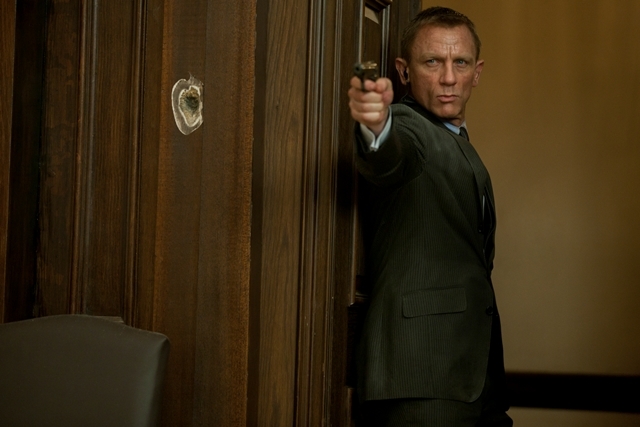 James Bond (Daniel Craig) opens the proceedings in the midst of a mission in Turkey. A computer drive has been stolen, containing the names of all the British Mi6 agency spies assigned by M (Judi Dench), who are undercover all over the world. After a classic chase, which includes rooftop motorcycling and railroad hopping, Bond is the victim of friendly fire and disappears. M comes under fire after that incident, and at the same time the agency becomes victimized by a series of terrorist attacks. The danger that London experiences through these attacks puts the agency’s relevance into question, especially from Mallory (Ralph Fiennes), an official from the Prime Minister’s office. When Bond reappears, he is put back into the field to find the terrorist, who turns out to be Silva (Javier Bardem), a computer hacker genius with former ties to Mi6. It’s old school spy techniques versus the modern world. Does James Bond still belong?